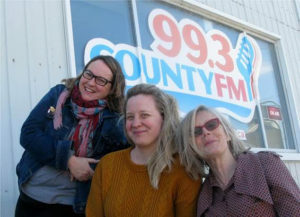 99.3 County FM, the member-owned, volunteer run non-profit community radio station serving Prince Edward County, has appointed a new volunteer team to broadcast ArtScene: Krista Dalby, Sarah Moran, and Julianne Snepsts. ArtScene is featured every Friday on The Grapevine news and information hour, airing each weekday following the noon news and repeating every weekday evening following the 6:10 pm Farm Report. Dalby, Moran and Snepsts take over from Vanessa Pandos, who established ArtScene when County FM began broadcasting in October 2014, and who ran the program for the past four and a half years. Under the new team, Krista Dalby and Julianne Snepsts will take turns hosting live in the studio on alternating Fridays, while Sarah Moran will be a reporter-at-large, recording feature interviews with artists in their studios and artistic events throughout the County. Krista Dalby is the Artistic Director of The Department of Illumination, which produces the annual Firelight Lantern Festival and public art project ICE BOX. She is a multi-disciplinary artist with an extensive background in theatre as playwright, producer and designer. Krista is one of the brains behind Creative Rural Minds, and can regularly be spotted at festivals around the County running art programming for kids. Sarah Moran has lived in The County since the late eighties. She is Director at Large for the Prince Edward County Arts Council board and also a member of the Save Picton Town Hall work group, a volunteer at the Milford Fair, a regular contributor to the South Marysburgh Mirror, and a volunteer at the Prince Edward Point Bird Observatory. Educated at London and Oxford universities, Sarah has worked internationally in communications. Julianne Snepsts is an improviser, comedy writer, and creative producer. She is a member of the County’s Artisanal Comedy Troupe: Taste That!, which regularly performs comedy in the County, and teaches improvisation to youth and adults. Julianne is a member of the producing team of Comedy Country and the Toronto Sketch Comedy Festival, and has been a producer/manager in theatre for nearly 20 years, working for Festival Players, Driftwood Theatre and The Second City, among others. Grapevine Supervising Producer Lynn Pickering said, “Thanks to Krista, Sarah and Julianne for volunteering to be the Artscene Team. As County FM heads to its 5th birthday, it’s great to know the tradition of excellent and wide-ranging coverage of the arts will continue.” To communicate with the team, email artscene@993countyfm.ca.